Follow the EASY instructions carefully to be eligible to win the Baby Dipper Bowl pictured at left, including the coordinating specially-designed spoon. Baby Dipper was a major sponsor of the goody bags at The Triplet Connection Convention in July 2009. The contest runs now until November 3, 2009. Entering this giveaway contest is FREE and simple. To be eligible, follow the EASY directions below exactly. Baby Dipper is supplying THREE (3) prizes and contestants are limited to U.S. residents only. Look! The Triplet Mom pictured below is feeding TRIPLETS, with just one hand. Just think how much easier it would be to feed even a single baby with this no-tip, well-designed Baby Dipper product. See the Baby Dipper Product Review which was just featured on MommyBlogExpert for more information about this wonderous sanity-saver for baby's caregivers. This Baby Dipper Giveaway ends on Thursday, November 3, 2009 at midnight PST. Shortly after all comments submitted have been verified, three random comments will be chosen. Each winner will be contacted by email and will have 48 hours to reply with their name and shipping address. If a response is not received from a winner within 48 hours, that winner will forfeit the prize and a new winner will be selected. Sorry, no exceptions. I have a 12 month old and I would love to have this so she can learn to eat for herself. I'd LOVE to win this! Im entering into motherhood soon so Im gobbling up all these good suggestions and products to make life easier. Just became a Baby Dipper Bowl Facebook fan! My little one is 10 months old and usually when I'm trying to feed her my other hand is wrangling my 3-year-old's lunch so being able to do this one-handed would be awesome! I'm following your blog now (at least I think so. I clicked on Follow at the very top and it says that I'm following... but then it seems to let me do that over and over so I hope at some point it registers me as a follower)! I follow MommyBlogExpert on Twitter (@thxmailcarrier). I already follow BabyDipper on Twitter (@thxmailcarrier)! I'm also already a follower of My Double Life blog (my ID is Xenia). My little man is 3 mos, soon he will be ready to start to eat, love to have this for him when he is ready! My baby is 13 months old and we should start giving him utensils to try out really soon. This would be perfect! 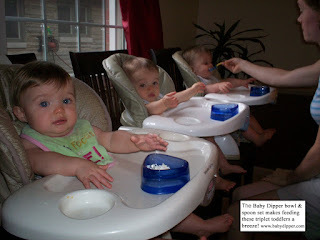 I have one-year-old triplets, and you should see the mess they can make at mealtime. TIMES THREE! We would LOVE to try the Baby Dipper. Tweet, and I am following @BabyDipper and My Double Life blog as Christy AKA Trippin' Mama. I would like to win this because my baby is 5 months old and we just started her on solids today! Following you on Twitter (a2editor). I tweeted but not exactly the phrase: removed the word "at" so it would fit in my Twitter character limit. I would love this bowl for any of my children. I have a 3 year old and a 1 year old who are patiently awaiting the arrival of their little brother in Feb 2010. I could use and use and use this bowl over and over. My youngest is nearly 4 months, and soon will start solids. He's nearly 7 years younger than his older siblings, and all our 'baby' gear is long gone! This would be a great start to replenishing the solid feeding tools that he'll need soon! And it's so adorably functional!